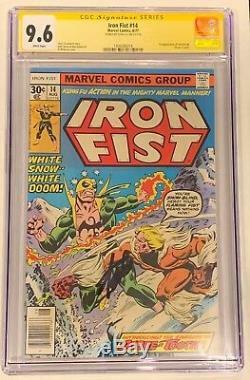 Iron Fist #14, CGC Graded 9.6 NM+ SS, White Pages. Signed by Stan'The Man' Lee on 05/11/18. 1st Appearance of Sabertooth, Wolverine's Nemesis or Brother! Iron Fist #14 is a Key Issue and considered one Marvel's Must-Have Collectable Comics. CGC Graded SS 9.6 Signature Series. There are only 30 Signature Series Books that Grade 9.6 , making this book Definitely RARE! Out of only 3960 #14's Graded, only 254 were graded with a signature... Less than 7% were Signed! And only 14 Grade Higher than this! Get a great deal on a HUGE investment grade book. Iron Fist made his debut on Netflix with mixed reviews but promoted a Defenders series as well. Word is that Disney will find a new way for him to appear in the MCU and if the X-Men get a reboot, expect to see Sabertooth along the way. Lots of Key Books Listed! Check out my other auctions. 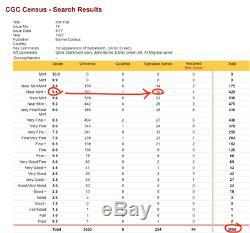 Reported from the CGC Census at the time this ad was placed. The item "Iron Fist #14 CGC 9.6 SS Signed STAN LEE NM+ 1st Appearance Sabertooth WP" is in sale since Monday, February 11, 2019. 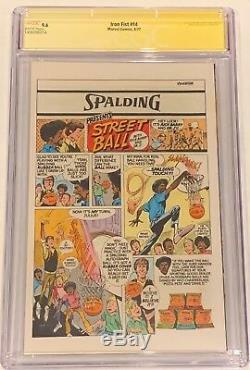 This item is in the category "Collectibles\Comics\Bronze Age (1970-83)\Superhero\Other Bronze Age Superheroes". The seller is "michaeparrell_0" and is located in Merrick, New York. This item can be shipped to United States. 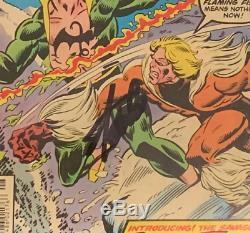 Modification Description: Signed By Stan "The Man" Lee!